Neil Gaiman's American Gods exists primarily as a discussion of two -ceptions: perception and deception. And those qualities of awareness and cloaking ultimately occupy sides on a single coin, a metaphor Gaiman applies liberally, and to great success, throughout the book. American Gods is also about abandonment and ego, failure and success, and above all, it is a study of the United States, and all its faith and design, reality and novelty. Gaiman excels in creating a lush world populated with colorful, lovable (and genuinely hate-able) characters as the text takes readers on a journey across the United States, from a prison cell to Chicago and Cairo (Illinois) and even the center of the continental United States. This sprawling epic is so large that error here or there would have been acceptable, and yet Gaiman doesn't misstep once. He keeps readers close by guiding the story behind the protagonist, Shadow, who tends to observe far more than react. And by avoiding a big personality in his main character, Gaiman creates mystery and an easy porthole into the action. And that attention to his audience makes the book extremely enjoyable, rather than overbearing and complex. But, as I said, American Gods is about perception and deception, first and foremost. In the text, the world, but specifically in setting, the United States, is home to gods like Odin, Anansi, Czernobog, Loki, Easter and others. All of them in the form of humans, living among us without our knowledge. Gaiman's world posits that once belief in a god is brought to a place, that god becomes a permanent resident, regardless of waning interest from the "followers" around him. As they lose followers they lose strength, and are forced to take on the form of average people. It is our perceptions, for Gaiman that make a god real, our faith and our religious fealty. But, when we stop paying attention these beliefs do not evaporate, they just become old and worn, and driven to deceive us in hopes of one day regaining prominence. But, Gaiman does something even greater by showing us how these gods decide to get by when they are no longer feared/loved greatly. Some turn to crime, some to wanderlust, some to drinking, others to upstanding civic service. But these positions are as thrust upon them as taken up by them, because America is the type of place that requires such labels and distinctions, America is the type of place that gives birth to grifting and entitlement. 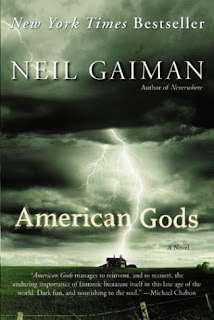 And America also gives birth to its own gods, as Gaiman points to television, railroads, government agencies, internet and others as the "new gods" that grow, blossom and die in our world daily. For Gaiman, America is a place of consumption, quick, easy and ruthless use that makes it no place for any deity. America will destroy an idea as easily as it will praise it. There's no room at the inn. Coins appear throughout American Gods, first as Shadow's hobby (coin tricks) in prison, then as gold and silver tokens that appear through magic means and have incredible powers. And like the coins, Gaiman wants readers to see that everything is 50/50. There is good and evil in all things, there is permanence and nothingness, and there is existence and nonexistence. Gaiman makes points of this with Shadow's wife Laura, with Mr. Wednesday and Lowkey, all characters who straddle a line, and are either attempting to get to one side of the "coin" or possess both at once. But it's also that coins represent wealth, and money is often the ultimate American god. Though Gaiman was careful not to spell such a sentiment out, I think it bears noting that money is the only thing we praise always and forever, and never forget. We sacrifice our time and lives to acquiring it. It's a bit melodramatic of me to say, I know, but it's on point. The coins, magical in fiction or not, hold a certain power over our consciousness. This rambling madness of this review is really meant to highlight the incredible strength of Gaiman's storytelling, and to point out that American Gods has its pulse not merely on fantasy and mythology, but also on philosophy of life. Fans of the Sandman series will surely enjoy this book, but anyone who has ever considered the nature of myth and religion, or the complexity of our systems of belief will surely dig right in. American Gods is as much a mirror on humanity as it is a fictional account of bygone divine creatures. And we sometimes need to glimpse our failings to learn more about ourselves.